The Carver Crew: Pat and Vanna: Here I Come! It's official. I've gone completely nuts. Call me crazy, but I'm auditioning for the game show Wheel of Fortune this Wednesday night. A great friend of mine heard that The Wheel was coming to the Tacoma, WA area this week and thought it would be fun to get a group of women together to go audition. You heard about peer pressure as a teenager. Well, I'm hear to tell you it gets even worse as an adult. Something I'd never dare do by myself is becoming all too easy to do in our large group. At last count, about 10 of us will be braving the crowds to try our luck & skill at The Wheel. We've done our research. (Research = watched YouTube videos of other "crazies" at auditions doing their chicken dances, cheers & karaoke routines hoping to get "noticed".) We're ready to impress. 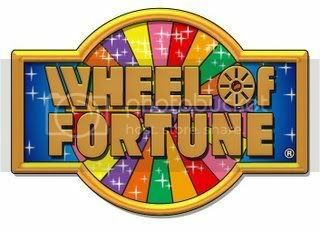 We've even come up with our custom designed Wheel of Fortune t-shirts. Stay tuned for pictures. Wish us well, especially me. We need all the help we can get. Very cool. I am always trying to get Dave to go on Jeopardy, and he is always trying to get me to go on Wheel of Fortune. So I want DETAILS on how much fun you have! Good luck! Good luck! I hope you girls get a chance to play! It sounds like so much fun. I wish I could go and at least watch the events unfold.